Tool Blog News Are Contact-Less Screws The Future? There are all kinds of fasteners available that can solve just about every fastening need. We have screws and nails, and when we don't want to see the fastener, we have glue and a lot of clamps. But if the Invis Mx from Lamello is any indication of what is to come, contact-less screws just might be the future. Yeah, I am talking about a screw that never touches the screwdriver. What invisible force do we know of that can move objects? 5 points if you said magnets. Lamello has developed a new product for people and industries looking for better invisible fasteners. The Invis Mx is truly the first fasteners that is completely invisible, and can still be fastened and unfastened with ease. The Invis uses a special two part screwing system that requires a male end to be driven into one piece of material and a female end to be driven into another. To fasten the two pieces together, a special driver is used to spin the male end using only magnetic fields. The Invis opens up all kinds of break-down furniture possibilities. The only question we have is how well a joint will hold up without becoming loose over time. 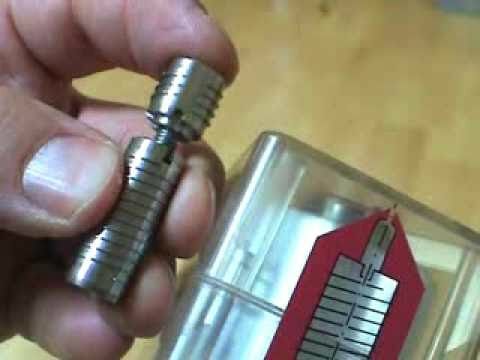 To get started, a kit will run you about $300 and after that each stud costs about $5. Invis- new and revolutionary joinery system. Invisible and detachable, a true Lamello product. Connections invisible as if glued, versatile as if screwed. Discover the New Generation Invis Mx. Invis has never been easier, faster or more cost effective. Visit us at: www.swissinvis.com, or call us for more information: 877-867-9019.